Easter is a Christian holiday celebrated around the world, Easter Sunday is the most attended service for Christian churches. 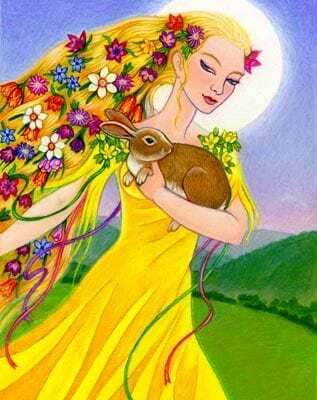 It is believed that originally Easter got its name from the Goddess of Spring ‘Eostre.’ Some believed that worshipping her would bring around the sun again in Spring, after it had died in the Winter. This year, Easter Sunday falls on 21st April and is a time where families come together to celebrate the resurrection of Jesus Christ after he is thought to have died on the cross on Good Friday. Easter Day was traditionally given to the first Sunday following the first full moon after the first day of Spring. This means that Easter can be as early as the 22nd March or as late as the 25th April. The earliest date of Easter would be 22nd March, when the notional moon falls on the 21st March, in a year where the 21st March is a Saturday (last happened 1818 – will next happen 2285). The latest date of Easter occurs when there is a full moon on the 20th March, meaning that the first full moon falls a lunar month (29 days later) – i.e. 18th April. To confuse things further there is also a ‘Sunday rule’, meaning in the above scenario if 18th April was a Sunday, Easter is celebrated the following week – 25th April (which last happened in 1943, and is next due in 2038). Unsurprisingly over the years there have been many discussions about ways to fix the date of Easter, especially as many things such as the timings of bank holidays and school holidays work around it. But there is never wide-spread agreement amongst churches, and as such the 5-week window continues. Many people understand the relevance and beliefs associated with Easter, but very few know why and how traditions and symbols came about, and their relevance to Easter. The much-loved Easter bunny became a part of the Easter tradition in the 1700’s. It is thought that when German immigrants became settled in Pennsylvania, their children would use their hats, grass or straw to create a nest due to their German traditions. If they were well behaved, the Easter bunny would reward them with coloured eggs. This tradition and story spread throughout the United States and many other countries around the world. The Easter egg symbolises new life, which represents Jesus’ resurrection from the tomb. Throughout history, many people carried the tradition of hoping to resurrect the dead, which is why Ostrich eggs were painted gold and silver and placed in graves, hoping to bring back Sumerians and Egyptians to life. Throughout the years, painting eggs and filling them with chocolates and sweets has become a more common tradition. In the UK, children associate the holiday with chocolate eggs, delivered to them on Easter morning by the Easter bunny! Similar to the myth of receiving coal instead of presents from Father Christmas, the same rule often applies to Easter. Children will not receive any chocolate Easter eggs from the Easter bunny if they have been naughty! The most popular Easter food aside from chocolate is lamb, which has remained a tradition in Christian households throughout the decades. This could be because of the symbolism associated with God sacrificing a lamb for his followers, so they were able to continue living. Other foods enjoyed at this time are Hot Cross Buns, Easter Biscuits and Simnel Cake. Although the tradition is now widespread, it is believed that the Easter egg hunt first originated in the USA. Another big Easter celebration in America is the annual Easter Egg Roll, which takes place at the White House. The tradition of the race dates back to 1878 where children and their parents first joined the president to roll coloured eggs across the South Lawn. Easter in the Philippines is a solemn and reflective celebration, where devotees remember the suffering and resurrection of Jesus Christ. Perhaps one of the more extreme customs is the re-enactment of the crucifixion on Good Friday. The agonising spectacle has become somewhat of a tourist attraction in recent years. Easter celebrations in Australia are similar to ours here in the UK but it’s the Easter bilby, not the Easter bunny, that delivers the eggs! Rabbits cause so much environmental damage in the country that they are often considered pests so the native, endangered bilby was chosen as its replacement. In Brazil, Easter is a festive time, where residents rejoice and celebrate with their loved ones. Streets are filled in the days leading up to Easter with a number of different fetes, festivals and colourful carnivals. Locals gather on the streets to construct straw renditions of Judas, who betrayed Jesus, setting each one ablaze! There is no better time than the present to sweep away any negativity that has entered your life. Fill your mind with positive thoughts! Easter is a time for new beginnings. Take advantage of any new opportunities and possibilities that come your way. Often, our initial reaction when something goes wrong is to embrace negative emotions. Allowing yourself to embrace positive thoughts, will become more natural in time. You will become healthier in body and in mind. You have the power to change and let go of the emotions that are weighing you down. When something goes wrong, do you have a ‘go to’ habit that makes you feel better? These habits mean you accept this behaviour whenever your emotions become too difficult. Instead, attempt to change your routine. These small changes will take a lot of willpower, but eventually they will alter your behaviour in a positive way. Avoid comparing yourself to others, whether this is a family member, a friend or a colleague. It’s human nature to see somebody happy and believe their life is better than yours, but that’s not always true. By spending energy on being envious of their success, you will dampen your spirits, and prevent you from achieving success. An opportunity will come your way once you start making small steps to achieving your goal. This goal should be obtainable, otherwise your spirit and ambition will be dampened. When you leave the house, avoid walking with your head down and shoulders slumped. Not only does this give off a negative aura, you are also not in an approachable stance. Instead, stand up straight with your shoulders relaxed; by altering your physical posture, you will instantly gain an emotional lift.